It's spooky quiet, dark and cold at 4:30 in the morning. Now awake, there is nothing to do but think. Too early to get out from under the warm covers and too late to go back to sleep. Whatever dreams that were playing out are now forgotten and its clear I am back from those travels. Of all the fresh thoughts rushing by, one stands out: I have made it to another day of life. There will come a morning when new days like this will not come. There will be no more. So while there is still time and life ahead, maybe its best to look at what still awaits. It may or may not end with a rainbow, but no matter what, it will end without regrets. That is my promise to myself. Late September, 2002. I'm sitting on a wooden stairway that leads down to the beach at Kiawah. Off to the south, I can see the dimming edge of the sunset reflected off of the water. I don't remember why I was there or what thoughts were swirling around inside, but I do remember the sound of the surf against the sand and the smell of the ocean carried by the wind. A block away, my two young daughters sit doing homework, or by now, watching TV and a small white dog named Clare waits patiently, eagerly, lovingly, for my return. At that place and time, I didn't know this flawless moment would come back a decade later on a cold January morning in the desert. I didn't know the speed of life. I didn't understand timeless perfection. There is a certain beauty to life, a magical journey through time. We share those moments with loved ones and each one of us looks back in longing affection at those simpler times. It's now 5:00am and the first light of a new day is streaming across the sky. Laying here alone, I love you. I didn't watch the game between the Ravens and the Patriots. It was the consolation game, the contest for the expansion league's "championship." But I did watch the real NFL championship game, the 49ers vs. the Giants. The game they call the Super Bowl is just a bunch of clever commercials, interspersed with a game between the AFC and NFL. Note, I said "NFL" as there is and has always been just one professional football league. Buffalo. Cincinnati. Jacksonville. Who are they kidding? So this is what we got Sunday: San Francisco went deep into the 4th quarter without a converting a single 3rd down. The Giants made the playoffs with a 9-7 record, meaning in the regular season,they lost almost as many games as they won. In a virtual tie game for all of the 4th quarter and into overtime, neither offense could score. Only a fumble, make that two fumbles, on punt returns allowed the winning team to barely win the game. Oh, the worst of it is now we have two weeks of New York and Boston coverage by the sports media. By the day of the contest, a game between an expansion league team and a mediocre 9-7 team will be heralded as the game of the century. Its all about selling commercial time and media hype. Its not football, its cheesy business. Hey, who was the college national champion? Had to think about it, didn't you? That's enough bellyaching for me. The Wings and Blues are on in a few minutes. The St. Louis Blues, another expansion team. Will it never end? At the beginning of the high tech bubble in 1997 you could have bought Apple Computer at $5.00 a share. It went to $37 at the high-tech peak in early 2000 then dropped back to $10 at the 2002 market bottom. By 2008 it was over $200. At the market lows of early 2009, back under $100. Three years later, as I write these words, Apple Computer is trading at $420 a share. 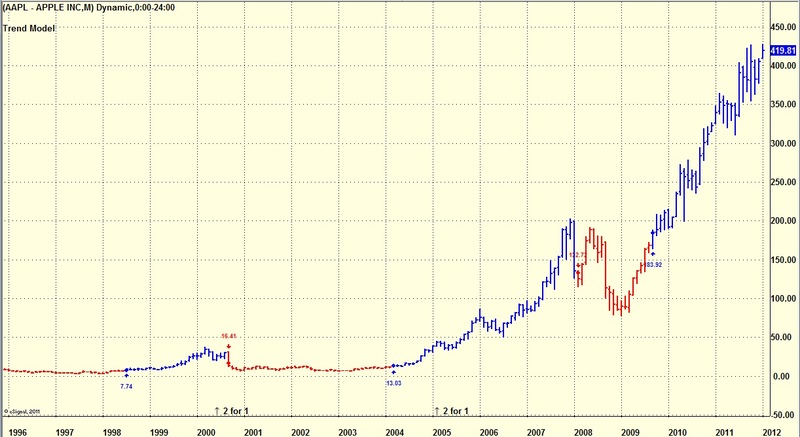 Let's throw out the riff-raff, in 15 years AAPL went from $5 to $420. I bring this to your attention to illustrate just how much wealth is available for the taking in the stock market. Real estate? You bought a house for $100K in 1985 and sold it for $500K in 2000. That's a 400% return in 15 years. Donald Trump is calling. When Apple rose from $5 to just $25 you had that same 400% return. Sorry, Donald, I can't come to the phone right now. Knowing that there are opportunities to make money, big money, in stocks is a starting point. Few people understand the very basic tenant of investing. The illustration above of Apple is an outlier, an extreme example of good investment fortune. Or is it? 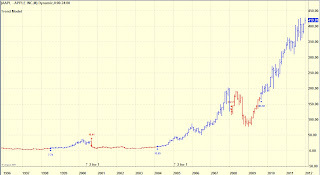 You can look at Apple as one huge 15 year long-trend. But, AAPL got cut in half in 2008-2009. Who has the grit to stay with a stock that has a 50% haircut in the midst of a scary bear market? Or asked another way, who can forecast the future direction of Apple or for that matter, any stock price? Take another look at the chart above and note that there are red and blue bars. The red bars are when my trend algorithm said to get out of AAPL, it was going down. The blue bars represent those times when my trend algorithm said to hold AAPL LONG, it was in an uptrend. The algorithm wasn't perfect. It was late a bar or two every time the trend changed. But it did catch 95% of the movement of the stock, both up and down. "Don't gamble; take all your savings and buy some good stock and hold it till it goes up, then sell it. If it don't go up, don't buy it." Rogers had the right idea, Harris has the right algorithm. Buy stocks that go up and sell stocks that go down. Listen to the math, its the best stock advice in the world.